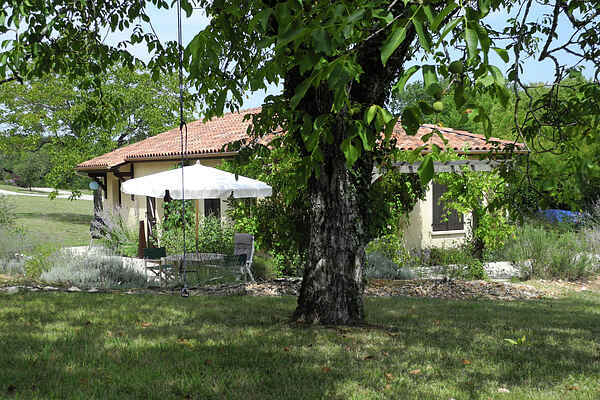 Just outside the fortress village of Ajat (1 km) lies a detached holiday home, in a wonderfully quiet location in the heart of Périgord-Noir. It stands next to the home of the friendly Dutch owner (100 metres away, just in sight), and has a shared swimming pool. Enjoy the shade under the pergola's grape vines. The house has a cosy living room with a comfortable seating area around the open hearth. The area is rich with tourist attractions. In l'Appel de la Fôret by Thenon (7 km) is a tree top adventure park that both young and old can enjoy. To follow up, try a trip to the awesome caves of Tourtoirac (18 km). Of course, you will also want to have seen the magnificent castle of Ajat. That also goes for the ruins of the ancient cloisters of the Knights Templar. Périgueux (33 km), the capital of the Dordogne, is definitely not to be missed. It's perfect for a day of shopping, enjoying a glass of wine and some local dishes on a terrace or a day of golf on the 18 hole golf course. There is also the imposing Château de Hautefort (26 km), a real eye-catcher.